The Castle Rock Chamber Foundation makes it easy to give back to the community in the simplest, most effective and tax-advantaged ways possible. The Chamber Foundation is a non-profit organization that helps individuals, families, agencies, nonprofit organizations, and businesses manage their philanthropic giving through various fund types. Serving as a vehicle for research, planning and community education to anticipate and communicate the challenges of the future. All contributions receive a full tax-deduction. Check donations may be mailed to Castle Rock Chamber of Commerce, 420 Jerry Street, Castle Rock, CO 80104. Please make the check payable to the Castle Rock Chamber Foundation. Within a few days, you will receive an acknowledgement letter by mail receipting the amount of your contribution. Donation Refund Policy: Donations will only be refunded in cases where the auction item purchased via a donation contribution is not upheld or cancelled. Please review our Privacy, Terms & Conditions and Return/Refund policy prior to making your donation. By making a donation, you are agreeing to these terms & conditions. Creating an opportunity to leave a legacy of outdoor community art and to foster the ability to broaden the entertainment opportunities at the Castle Rock Artfest. To foster a strong local economy by encouraging entrepreneurial and business activity by offering business training and consultations for successful business development and growth. Assists emerging and recognized leaders to expand their skills and enhance their knowledge of local and state issues as well as leverage their individual passion to make positive changes in the community. The program brings diverse people together and creates an expectation of servant leadership and builds opportunities to increase skills and knowledge. Following the Leadership Douglas County graduation, to continue their impact in our community the Alumni work to continually foster the philosophy of citizens coming together to give back to those in need. 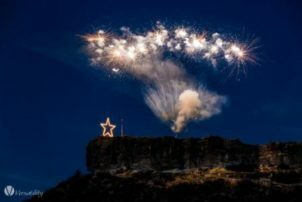 Supports the annual Starlighting event in Castle Rock in featuring the lighting of the Star and communicating the historical significance of the signature event. No specific fund will be earmarked.